BERKELEY, California, Jun 22 2012 (IPS) - The city of Berkeley, California has long been regarded as a leader in the movements for peace, free speech and civil liberties. But this very city is now poised to follow the lead of hundreds of others around the United States where local police deploy armoured vehicles to fight crime and terrorism. The University of California, Berkeley police department is using grant funds from the Department of Homeland Security to purchase a Lenco Ballistic Engineered Armoured Response Counter Attack Truck, better known as BearCat. The university will share the BearCat with police from Berkeley and the neighbouring city of Albany, where it will house the vehicle. Purchasing the vehicle was raised at a Berkeley City Council meeting as part of a larger discussion on the city’s relationship to Homeland Security agencies that award grants and collect information on citizens. Police Chief Michael Meehan defended the BearCat, telling the council he would have used it last year in a situation where a mentally ill man held off police officers with a gun for several hours. An armoured vehicle would have allowed negotiators to safely approach the suspect, Meehan said, although in this instance, police eventually took the man into custody without incident. But Daniel Borgstrom, Occupy activist and former Marine, warned the council on Jun. 19 that the vehicle could be used to chill free speech. “I’m asking, please stay out of this urban warfare stuff,” he said. While Meehan called the armoured personnel carrier “a defensive resource” without weapons, Councilmember Max Anderson argued that the vehicle has gun ports and that weapons would be easy to supply. “While we might count [the vehicle] as being protective of officers, they also carry an offensive component that could be misused under certain circumstances,” Anderson said. Citizens and councilmembers also criticised the secrecy with which the purchase was taking place. Because the vehicle is being purchased by the university, and not a city governed by elected bodies, and because no matching funds were required – which the council would have had to approve – the Berkeley police department was not required to disclose the grant application. Berkeley citizens found out about it only when the watchdog organisation, Berkeley Copwatch, discovered the project as a result of a Public Records Act request for general information on police equipment, according to Andrea Prichett of Copwatch. The armoured vehicle has not been publicly discussed in Albany, and no such discussions are scheduled, according to Albany’s city clerk. Occupy Cal activists contacted for this story were unaware that the university was buying the armoured vehicle. “I feel a certain level of – I have to use the word – betrayal,” attorney Sharon Adams told the council. Adams works with a community coalition that has been meeting with police over concerns about local Homeland Security agencies, including the Urban Areas Security Initiative that is awarding the university about 200,000 dollars to purchase the BearCat. “During all this time, police never told us they were going for this armoured tank,” she said. Since 9/11 and with a surplus of combat equipment, armoured vehicles have become popular in larger higher-crime cities like Oakland, California, as well as tiny crime-free places like Keene, New Hampshire, where just two murders have been reported since 1999. 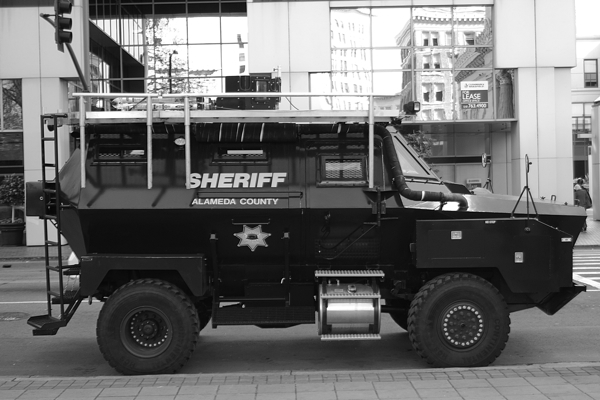 These armoured vehicles are part of “an alarming increase in militarisation” of the police, said Norm Stamper, former Seattle police chief and author of Breaking Rank: A Top Cop’s Exposé of the Dark Side of American Policing. Stamper explained in a phone interview that, in addition to 9/11, the war on drugs has fuelled the drive toward police militarisation, exacerbating conflict between those targeted – people of color, youth and the poor – and law enforcement. Once targeted, these communities become the enemy. “We start adding the military nomenclature and the military equipment and military tactics and strategies, and we find SWAT units hitting the house of somebody suspected of having half a bag of marijuana,” he said. Locally, police militarisation was evident at the Nov. 9, 2011 Occupy Cal demonstration at UC Berkeley, where combat-gear clad police injured peaceful protesters with baton strikes, and on Oct. 25, 2011 in Oakland, when similarly armed police nearly killed a young former Marine when they fired a tear-gas canister that hit him in the head. When police carry weapons and use chemical agents on non-violent demonstrators, they “appear to be the repressive arm of an oppressive establishment”, Stamper explained. An armoured personnel carrier would serve to reinforce that impression. A necessary piece of equipment? However, Stamper allowed, an armoured vehicle can save lives, when used correctly. When Stamper was on the San Diego police force in the 1980s, a man shot and killed 21 people at a McDonald’s restaurant over the course of more than an hour. An armoured vehicle could have ended the event more quickly, he said. Police Chief Meehan acknowledged the growing militarisation of police, noting that in a highly armed society and country like the United States, which has 200 to 300 million gun,”there’s a limited way to protect our officers, especially when you’re talking about gunfire”. The question of whether the armed vehicle is necessary remains: the last time Berkeley police officers were killed by gunfire was in the 1970s; no UC Berkeley or Albany officers have been killed by guns, according to the website Officer Down Memorial Page. Councilmember Kriss Worthington placed the armoured vehicle on next week’s Berkeley council agenda for further discussion. “If this is a joint application that includes the city of Berkeley and the city of Albany, it seems to me that there should be a public vote of the Albany City Council and the Berkeley City Council,” he said. UCB, a major Defense Department Contractor, has always maintained a police state in that part of Berkeley. When you see the hippie 60’s protests framed by the TV propagandists, you might get the idea the Police were the perps, but it’s the semi-private police force the U.C. System and State of California allows. Realize: Police Departments have Chiefs and Sheriffs Departments have Sheriffs who are elected by citizens or appointed by Mayors who are elected by Citizens they answer to. A Campus Police Force only answers to the unelected University Chancellor. Do Americans really want a SWORN, ARMED (to the teeth), now ARMORED Police Force that is completely UNACCOUNTABLE to the People? Too late, you’ve got it.